Dance act Basement Jaxx have been drafted in to replace Kylie Minogue as headliners at the Glastonbury Festival. They have been brought in as last-minute replacements after Minogue was forced to pull out after she was diagnosed with breast cancer. Glastonbury organisers have also added Primal Scream to Sunday's line-up on the Pyramid Stage. More than 110,000 tickets have been sold for the festival, which will be held on 24-26 June. Basement Jaxx have been one of the biggest bands on the dance scene since their first hit single in 1997. 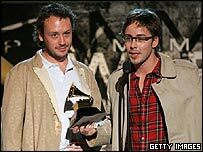 Band members Simon Ratcliffe and Felix Buxton won a Grammy award in the US earlier this year for best electronic/dance album. Among their best-selling hits are Red Alert, Where's Your Head At and Good Luck. Basement Jaxx are a departure from the usual rock bands that headline the Glastonbury Festival, as was Minogue's planned appearance. She announced she would be unable to perform in May, as she revealed she would be undergoing an operation to remove a lump in her breast. The 37-year-old also scrapped the Australian leg of her world tour. Other acts on the Glastonbury bill include Coldplay, New Order, White Stripes, The Killers and the Beach Boys' Brian Wilson. Glastonbury founder Michael Eavis has already announced there will be no festival on his Worthy Farm in Pilton, Somerset, in 2006.